Held down by heavy-duty restraints, a Falcon 9 rocket fired up its nine Merlin engines for more than three seconds Thursday evening in a key readiness test before launching from Florida with a commercial television broadcast satellite next week. The nine Merlin 1D engines ignited at 6 p.m. EST (2300 GMT) at Kennedy Space Center’s launch pad 39A, sending a rumble across the marshy landscape at the Florida spaceport. The test is a customary step in SpaceX launch campaigns, offering a chance to wring out any kinks in the Falcon 9 rocket and ground systems, practice countdown procedures for the launch team, and verify the readiness of the booster’s main propulsion system. The rocket will now be returned to the hangar at pad 39A for attachment of the EchoStar 23 spacecraft, a commercial television broadcast satellite that will beam video programming to homes and businesses in Brazil. Liftoff is scheduled for a two-and-a-half hour window opening at 1:34 a.m. EDT (0534 GMT) Tuesday. Attempts to perform the hotfire test Tuesday and Wednesday were scrubbed for unknown reasons. SpaceX declined to comment on launch preparations in advance of the static fire, but the delays forced a two-day slip in the mission’s targeted launch date from Sunday to Tuesday. The company confirmed in a tweet Thursday evening that the static fire was completed. 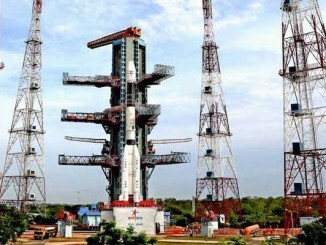 Engineers will crunch data from the hotfire to verify all systems functioned as intended, then convene a launch readiness review in advance of the final countdown, which will commence Monday night. EchoStar 23 is already encapsulated inside the Falcon 9 rocket’s payload fairing after fueling inside a clean room at neighboring Cape Canaveral Air Force Station. 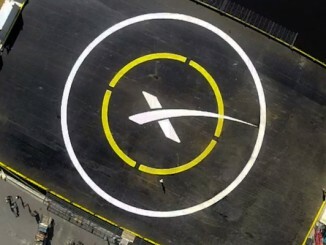 The composite will be installed on the rocket once the Falcon 9 is lowered and rolled back inside SpaceX’s hangar. Built by Space Systems/Loral in Palo Alto, California, EchoStar 23 will be deployed into geostationary transfer orbit, an elliptical loop around Earth favored as a drop-off point for communications satellites heading for operating posts more than 22,000 miles (nearly 36,000 kilometers) over the equator. At that altitude, a spacecraft in orbit will move around Earth at the same speed the planet rotates, allowing the satellite to remain fixed over the same location. EchoStar 23 will use its own thrusters to reach a position in geostationary orbit at 45 degrees west longitude, where its telecom package will broadcast direct-to-home television to customers in Brazil. SpaceX has suspended its practice of conducting some static fire tests with the mission’s satellite payloads already on-board the booster since a rocket exploded during fueling for a hotfire last September, destroying the launcher and the Israeli-owned Amos 6 communications satellite. 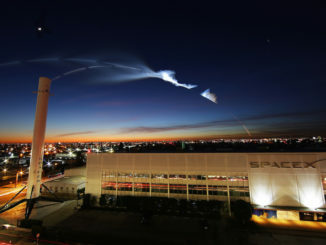 Investigators traced the explosion to a problem in the second stage’s helium pressurization system, and SpaceX says it has modified the way it loads helium and propellant into the rocket to avoid a recurrence of the issue. Hardware changes to permanently rectify the problem will come later, the company said. SpaceX has not ruled out resuming static fire tests of fully-assembled rockets in the future, which would save one or two days in each launch campaign. 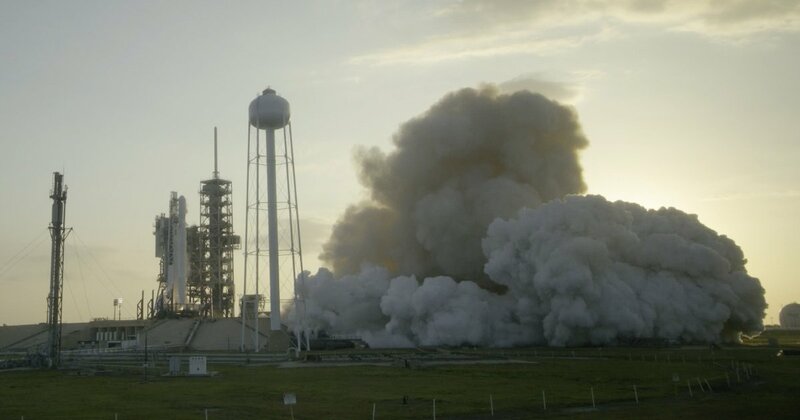 The Sept. 1 explosion damaged SpaceX’s primary Florida launch pad — Complex 40 — forcing the company to relocate launch operations to nearby pad 39A, a site which hosted liftoffs of Saturn 5 moon rockets and space shuttle missions until it was decommissioned in 2011. SpaceX leased pad 39A from NASA in 2014 under a 20-year agreement, and crews prioritized modifications to the facility to support Falcon 9 flights in the aftermath of the explosion at Complex 40. The company resumed launches Jan. 14 on a mission from Vandenberg Air Force Base in California with 10 next-generation communications satellites for Iridium. On Feb. 19, SpaceX restored pad 39A to service with a successful blastoff of a Falcon 9 rocket carrying a Dragon supply ship to deliver cargo to the International Space Station. Tuesday’s predawn launch will be the third Falcon 9 flight of the year, and the second at pad 39A. The commercial mission will be the 31st launch of a Falcon 9 rocket since the privately-developed booster debuted in June 2010. It will be the first Falcon 9 flight without landing legs since April 2015. The rocket will not attempt a recovery at sea or on land because the EchoStar 23 satellite requires all the Falcon 9’s fuel capacity.